← How to quickly convert PDF to PS? Wanna easily convert PDF to EPS? Wanna convert PDF to EPS? EPS, short for Encapsulated Post Script, is a graphic file format frequently used by artists and graphic designers with specific equipment configurations. I you are a artist or graphic designer, sometimes you may need to convert PDF to EPS. VeryPDF PDF to Any Converter can easily and quickly convert PDF to EPS. Before install & run VeryPDF PDF to Any Converter, you need to download it. double click its shortcut icon on desktop to run it. You can click the [PDF to EPS] button in the left column of the main interface before or after clicking the [Add] button on top of the main interface to add the PDF files that you want to convert to EPS. You can also delete the PDF files you added by [Delete] (delete the PDF files one by one) and [Clear](remove all the PDF in the list). Before conducting some setting, you need to click [Setting] button on top of the main interface to open the setting interface. Then you can set the page range resize page in pixel, reset the resolution and choose the color depth according to your own need. You can also skip this setting step. But if you conduct some setting, please do remember to click [Apply] button to make settings enact. Choose a place where you would like to put the EPS file via clicking [Choose] at the bottom of the main interface. 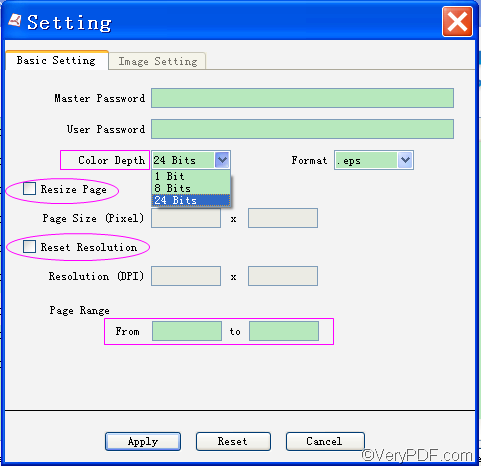 The last and key step is to click [Start] button to start to convert PDF to EPS. If you have any questions about how to convert PDF to EPS, please contact us through support team. This entry was posted in VeryPDF Blog and tagged convert PDF to EPS. Bookmark the permalink.